Hot Stove: Enter Ichiro, Figgins? Ichiro is reaching out to other teams and Jon Heyman thinks the Phillies are one of them. 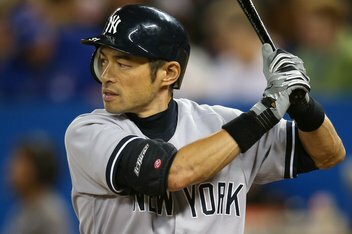 CBS Sports’ Jon Heyman reported today that Ichiro has begun to reach out to teams other than the Yankees and stated in a Tweet that the Phillies “could be one“. The incredibly durable outfielder was pretty bad defensively in a small stretch in center for the Yankees but played above-average to elite defense in his normal corner positions for them. Ichiro has averaged 159 games played in 12 Major League seasons and hit .283/.307/.390 for Seattle and New York, a tick below his Hall of Fame worthy .322/.365/.419 line. Ichiro had been waiting until the Yankees had finished signing their pitchers first, which reportedly is their method of conducting off-season business. This is the first time this off-season that Ichiro has been connected to any team other than the Yankees. Opinion: Ichiro would be an upgrade in either right or left but may be a liability in center defensively. Ichiro, in my opinion, is an every day Major League player, even at age 38 and one I’m rooting for to reach 3,000 hits (2,606). That said, I would rather give the keys to right to Domonic Brown, take my chances with Darin Ruf in left, and fill in the blank in center. Jon Paul Morosi of Fox Sports reported today that the Phillies have checked in with free agent third baseman Chone Figgins. For a nice back and forth of the pros and cons of Figgins, check out an opposing view points column my colleague Ryan Dinger and I put together as Figgins was released. In short: Ryan says why not give him a Minor League deal, I say the ship has sailed and stay as far away as possible. Pagan and Victorino? Not at a Bargain Bin Prices! Buster Olney of ESPN wrote today that Shane Victorino is looking for someone in the neighborhood of $9-10 million dollars per year and that the Giants would be potential suitors should the Phillies sign Angel Pagan. When the folks on our fine Facebook fan-page suggest that the Phillies bring back Victorino or sign Pagan “at a discount”, I’m not sure this is what they meant. This is the first time, however, that numbers are starting to come forward regarding the bottom of the upper tier of free agent center fielders, meaning that the winning price tag on Pagan could be anything from $10-14.999 million. In the same article, Olney reported that nine teams in the first twelve hours of his free agency called Nate Schierholtz. Among the interested suitors include the Yankees and Rays. Anthony McCarron of the New York Daily News reported today that Eric Chavez will play in 2013. Opinion: Chavez, .281/.348/.496 in 2012 over 113 games for the Yankees in 2013, could be a potential platoon-mate with Kevin Frandsen.